Not most of the bloggers around the web are good at designing, and the WordPress platform understands this very well. Although one would find the tools like Adobe Photoshop, Gimp etc. pretty hard to use and time-consuming too, they won’t look around much to see for the better, easier and faster alternatives. 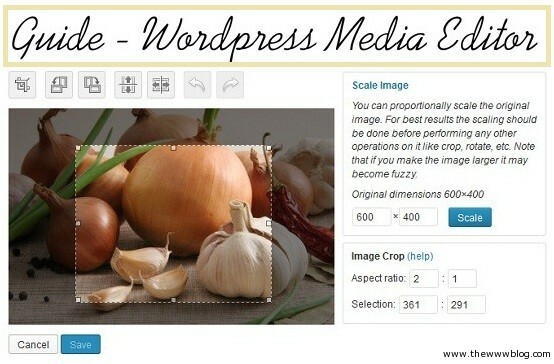 What we are stressing upon, is the Media Editor which is a built-in feature available in the WordPress Admin Panel, and it has all the basic stuff that a blogger would want to do, and the basic stuff we are talking about is the cropping, scaling and rotating of the uploaded media files. The image editor is available in the WordPress Administration panel from the version 3.1.3 and this comes to the rescue many a times, especially if you have a hobby of photography and sharing the captured photos is what you love to do, but while traveling it isn’t easy to spend time and play around with the photo and publish it. 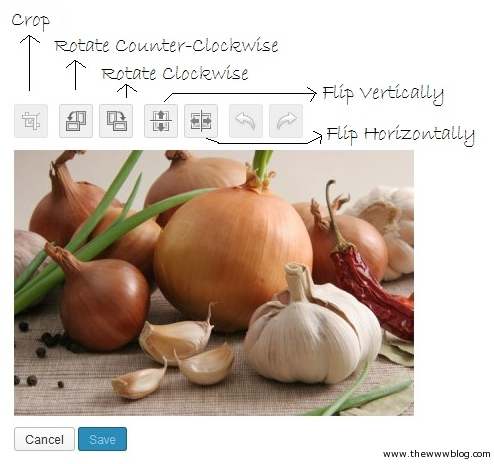 Below is the tutorial of “How-to” of the image editing in the WordPress admin panel. In the Add New page, you should be able to upload the Media file by either selecting from the file system, or simply drag and drop the file into that box, the option which is easier for you. 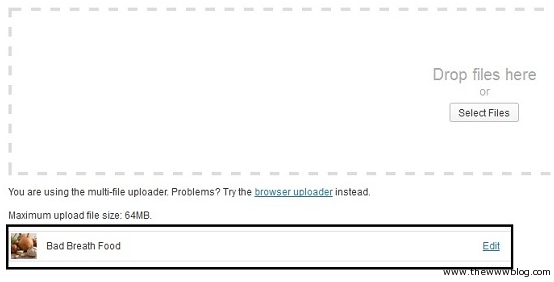 Based on the hosting and setup done for your blog, the maximum file size is indicated, which in our case as shown is 64MB. Once the file is selected, the progress indicator would let you know about the upload and after the upload is completed, there’s that “Edit” option which we are talking about. The Media file Edit page would have the options to edit the title, description, alternate text and the caption of the image. Now, to go to the actual editing options you need to click on the “Edit Image” link just below the Image which you uploaded. Crop the image: Use the cursor to select the rectangular area in the image which you wanted to select, and crop the original one. Rotate: The rotation of the image can be done both clockwise and counter-clockwise, and this is needed many a times when you have clicked the pictures on your smartphone in the portrait mode and see it rotated after the upload. Flip: The image can be flipped vertically or horizontally, which basically means rotated by 180-degree either vertically or horizontally. Scale: The scaling can be done proportionally, based on one side of the image. Making it larger would reduce the quality, and make the image fuzzy. The always-important Undo/Redo functions are available just beside the list of editing options. Adjusting the size of the image is done by cropping, where the user selects a particular rectangular area on the image which is smaller than the original image that is uploaded. 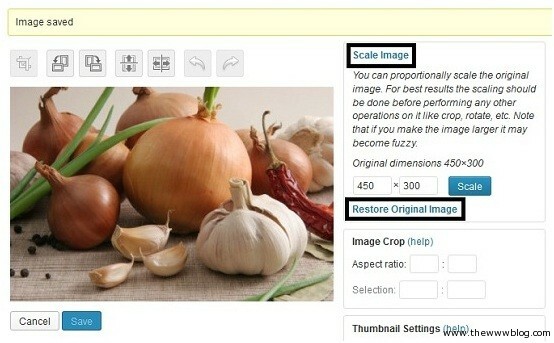 If the entire image size has to be reduced rather than a single section, then the scaling option would do where you need to mention the size of one side, and the panel would do the rest. 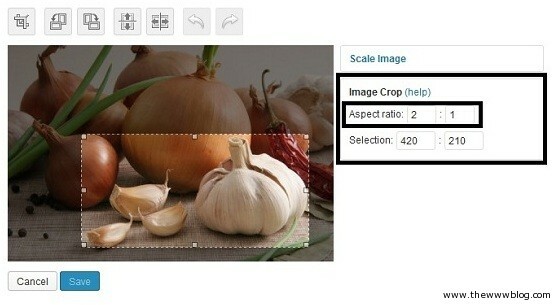 To select the crop area, left-click and hold it and then drag it while holding it down till the desired area is selected. Once the area is selected, it would look as shown in the picture below. You may click on the first icon “Crop” and this will produce the smaller picture for you to save it separately and insert into the post. 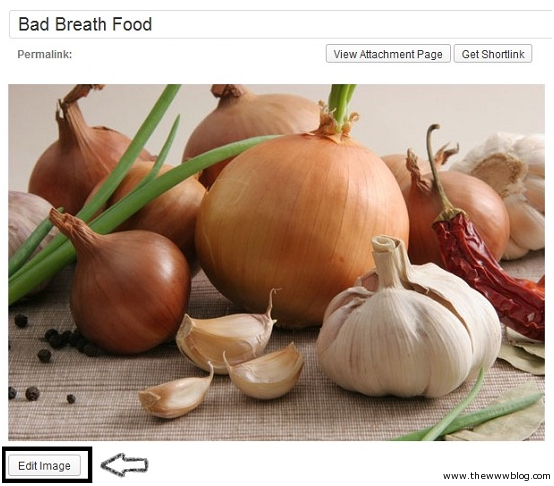 In the picture that we have uploaded here, the captured image has got different vegetables which weren’t necessary here and we wanted only the Garlic to be focused. 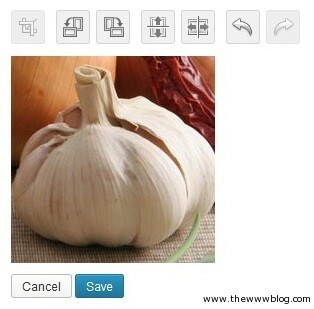 Thus, drag the mouse and select the garlic and select “Crop”. That is how easy the feature is, and better than doing that offline on your computer and making multiple cluttered versions of the single image. Everything that is around you, perfectly set, has an aspect ratio. Even your computer screen, TV screen and the Smartphone display has got an aspect ratio set. The same has to be maintained when you are cropping the image, but that may have exceptions. Maintaining an aspect ratio is quite easy here, where you enter than in the right section and then while selecting the area in the image frame, hold down the shift key so that the selection box expands with the aspect ratio maintained. 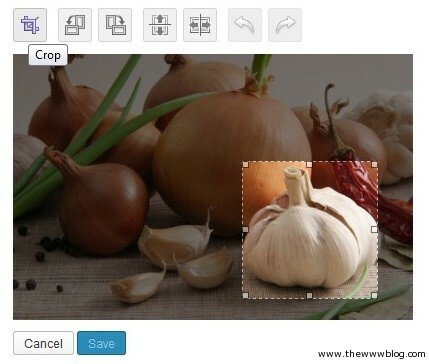 The box can be easily dragged after you have settled for a particular pixel count for the final image size, and apart from the initial hold and drag, you could set one dimension of the image in the “Selection” box, and the selection area would be automatically made for you to just move it around to select the area you want to crop. Looks simple and easy, and does look quite empty, but there’s a lot to play around with, to bring multiple versions of a single uploaded image and rotating, flipping, scaling and cropping with a proper ratio of the sides is not something hard to do using one of the several tools around, but when the WordPress admin panel has got that for you, why to look out for the 3rd party options. Plus, you get these all options directly available, compared to the hidden deep ones even in the softwares like Adobe Photoshop where you need some learning and expertise to carry out even the simplest stuff. Check what media files are accepted by Media Library in WordPress, and if you are looking to use the WordPress admin panel through your smartphone you can try the WordPress Android app which does some neat job but doesn’t have all the benefits that a web based version has got.